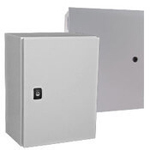 The mild Steel enclosures are constructed of high-strength carbon steel. These enclosures are finished with a highly-durable powder coat paint that provides corrosion resistance and enables both indoor and outdoor use. 8 x 8 x 6" to 35 x 31 x 12"
6 x 6 x 4" to 36 x 30 x 12"
8 x 8 x 6" to 55 x 39 x 12"
6 x 6 x 4" to 72 x 36 x 16"
12 x 12 x 8" to 42 x 30 x 12"
16 x 12 x 6" to 72 x 36 x 16"
4 x 4 x 3" to 16 x 14 x 10"
29 x 24 x 12" to 65 x 36 x 16"
24 x 42 x 8" to 48 x 48 x 16"
20 x 20 x 8" to 60 x 37 x 16"
24 x 20 x 8" to 60 x 37 x 12"
9 x 12 x 6" to 9 x 36 x 6"